Please Note: We've changed the dates of this Throwdown Challenge to accommodate 31 Days of Halloween and give our teams some extra time to create. The new deadlines are in November; please see the "dates to know" section in the post! Welcome to the October/November Design Team Throwdown! In case you don't already know, the DT Throwdown is a fun and furious (but friendly) competition between design teams to show their stuff. The winner receives massive bragging rights, featured banner space on our Smeared and Smudged Forum and Facebook Page, and the honor of choosing the next challenge theme. The competition is intense, the projects are beyond inspirational, and the teams are diverse and outstanding. The best of the best! We hope you will enjoy the monthly challenge as either a participating team or an observer, and don't forget to vote when the time comes! 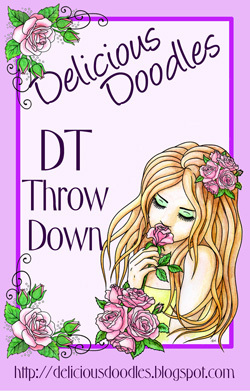 Now for a little housekeeping...the official rules of the DT Throwdown are located in the left sidebar. Be sure to look them over. There is also a "quick start" mini-guide, cleverly presented by our skeleton king, in the right sidebar for any teams that want to join in. Follow the four steps and you're in! Finally, once teams have submitted their banner, no need to resubmit for each challenge unless you have made a change to it. Just remember to send in your theme each month before voting starts! And finally, please remember that each project must contain at least 1 stamped images, either rubber or digital. Okay, there you have it. Now on to the fun part! For October we are excited to bring you our 10th challenge, picked by our Challenge #9 champs SMEARED INK! This theme has two parts. First, participating teams must incorporate the use of either real or faux parchment paper. Second, it must include some reference or imagery representing "undead". Don't forget to include your stamped image and bring your A-game. Use your imagination and throw down! *In case of a tied vote, we will have a tie-breaker vote on Saturday, November 30 until 5pm between the two teams with the most votes. Winner will be announced at 5pm. Congratulations to the winners of our 9th DT Throwdown Challenge!